Muslims and Buddhists clashed in Myanmar's northern city of Lashio on Tuesday, witnesses said, as a wave of sectarian violence reached a mountainous region near China's border. Phone lines were down in the city of about 131,000 people and the extent of the violence was unclear. 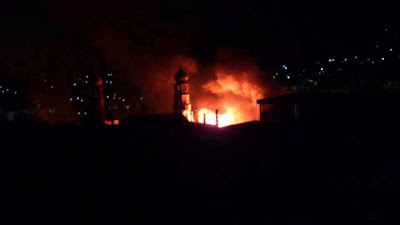 Witnesses reported several large fires and said a mosque and Buddhist monastery appear to have been torched. The violence followed unrest between Muslims and Buddhists in other parts of Myanmar over the past year, including fighting in the central city of Meikhtila in March that killed at least 44 people, mostly Muslims, and razed several Muslim neighborhoods. About 12,000 people lost their homes. Lashio, capital of Shan State, had been spared from the religious unrest. Known for its strong Chinese influence, it is about 190 km (120 miles) from Muse, a city on China's border. Hajji Aung Lwin, a Muslim man from a village on the outskirts of Lashio, said the fighting appeared to have begun after a violent quarrel between a Muslim man and a Buddhist woman. After police detained the man, local Buddhists surrounded the police station and demanded he be handed over, he said. The mob then tried to set Myoma Mosque, near Lashio market, on fire, he said. A second witness reporting seeing flames in the city and a large building on fire. Sectarian clashes between Buddhists and Muslims, who make up about 5 percent of the population in the Buddhist-majority country, have erupted several times since a quasi-civilian government took power in March 2011 after five decades of military dictatorship. The most serious attacks took place in Rakhine State in the west in June and October last year, when Buddhists fought against Rohingya Muslims, who are denied citizenship by Myanmar and seen by many in the country as illegal immigrants from Bangladesh. At least 192 people were killed.